Such decrease may be partially driven by a longer wet season in 2017, resulting in fewer fires in peat and avoiding the 2015 fires crisis from happening again. 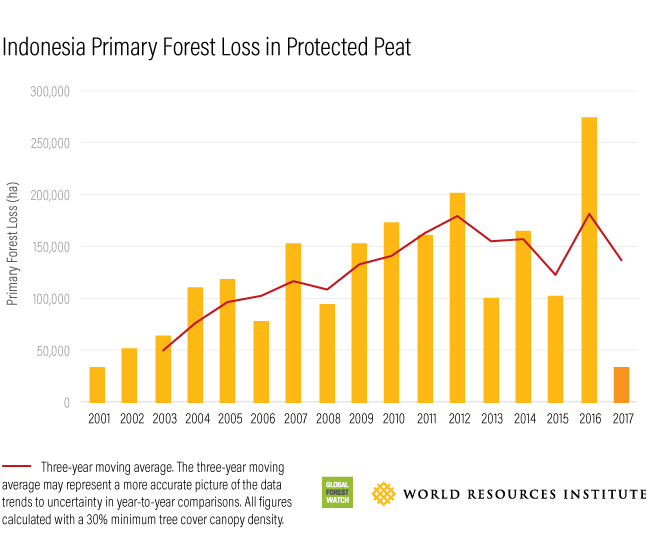 However, the decrease also coincides with a number of government actions to curb land clearing in peatland and forests. First, Indonesia's president established the Peatland Restoration Agency, tasked to coordinate the restoration of 2.4 million hectares (5.9 million acres) of peatland in Indonesia. Second, the government issued a regulation to ensure a suitable water level in peatland and ban all new land clearing and canal building on peatland, even in existing concession areas. Sub-national elections, which took place in June, may have also contributed to less peatland and forest fires as local politicians have greater incentive to prevent fires. This year's Asian Games, to be hosted in both Jakarta and Palembang (the capital of South Sumatra) in August, has also driven the government to intensify efforts to prevent the burning of forests and peatland. Third, monitoring deforestation can be a valuable tool. 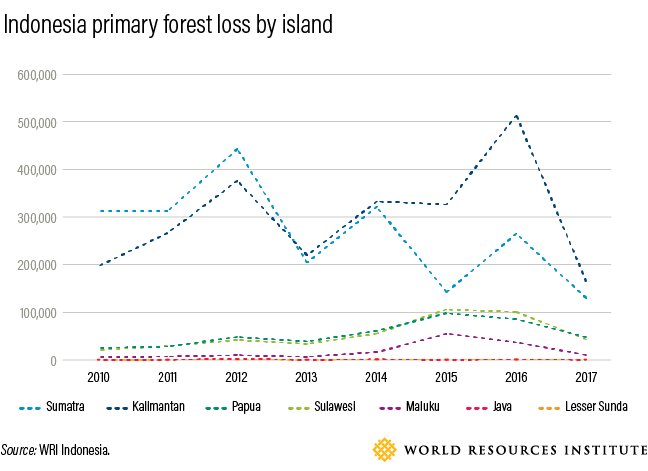 Spatial data tools such as Global Forest Watch provide tree cover loss alerts in near real time, enabling the government and public to prevent the clearing of protected peat areas and forests. In Peru, weekly deforestation alerts help identify forest encroachment and construction of illegal logging roads in the Peruvian Amazon. In Indonesia, monitoring government commitment to peatland protection is also part of the public's responsibility to ensure a healthy environment. Pantau Gambut, an Indonesian civil society coalition platform that provides information on the commitments from government, public, and companies, enables public to ask stakeholders to fulfill their pledges.